This Roulette Quiz has 10 wheel questions and answers plus 2 bonus Q&A. This quiz is sure to be challenging and entertaining for passionate players as Roulette is one of the most popular online games worldwide. In this spin around the wheel, you can test your knowledge of the game, online roulette play, terms, lingo and the betting odds. 1) The game of Multi-Wheel Roulette Online features what option to play? 2) With the Roulette Online variation of Spingo, it is described as a mix of what 3 games? 3) The Single Zero on the European Roulette is positioned where on the roulette wheel? A. Between black 29 and red 34. B. Between black 26 and red 32. C. Between black 17 and red 23. 4) Which is the correct payout for these Roulette players bets? A. Column: Any 12 numbers in a column pays 2 to 1. B. Dozen: 1st 12, 2nd 12 or 3rd 12 numbers pays 2 to 1. C. Both payouts are correct. 5) Which is the correct payout for these Roulette game bets? A. Red or Black pays 1 to 1. B. Odd or Even pays 2 to 1. C. 1 to 18 or 19 to 36 pays 2 to 1. 6) Which is the correct payout for a Split Roulette bet? Wagering on two numbers at once. An inside bet. A. Pays 8 to 1. B. Pays 11 to 1. C. Pays 17 to 1. 7) Which is the correct payout for roulette players with a Corner bet? Alternate terms are Square Bet or Quarter Bet. A. Pays 5 to 1. B. Pays 8 to 1. C. Pays 11 to 1. 8) The house edge on single-number roulette bets are? A. Is higher than on even-money bets such as red/black or even/odd. 9) What does the term Dolly mean in roulette games? A. The tray that holds the Roulette chips for purchase. B. The device used by the dealer to mark a winning number. C. The device that pushes the bills into the table slot. 10) What does the term Street mean on the Roulette wheel? A. Three numbers in the first Column. B. Three numbers in the first Dozen. C. Three numbers that run across the roulette table layout. . Answers to Roulette Quiz. Did your pick the right numbers with this quiz spin? 1) C. Multi-Wheel Roulette: this exciting option permits betting on up to eight tables at the same time. For this option, players bet on one table but every wheel counts. 2) A. Spingo: Mix Bingo, Lotto and Roulette together and you get Spingo where your bets are placed on various colors while numbered Lotto balls are bouncing about. 3) B. Single Zero is positioned between black 26 and red 32. 4) C. Both Column and Dozen payouts are 2 to 1. 5) A. Red or Black pays 1 to 1, as do Bets B and C.
6) C. Split Bet: Any 2 neighboring numbers pays 17 to 1. 7) B. Corner Bet: Any 4 contiguous or bordering numbers pays 8 to 1.
five-number bet on 0, 00, 1, 2 and 3. On that combination, the house edge is 7.89 percent.The European wheel, with no five-number bet since there is only one zero, has a house edge of 2.7 percent on all wagers. 9) B. Dolly: device used by the dealer to mark a winning number. Plop that down on my number, Mr. Croupier. 10) C. Street: Three numbers that run across the roulette table layout, e.g., 16, 17 and 18. 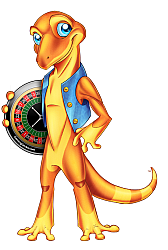 11) What is the Chameleon Strategy in Roulette? A. Betting only red or black and not changing your color choice. B. Copying the betting patterns of winning players at the roulette table. C. Betting only odd or even numbers consistently. 11) B. Copying the betting patterns or strategy of winning players at the roulette table. 12) What are Square Bets in Roulette? A. Betting on 4 numbers at once. B. Betting on 3 numbers across and the Single Zero. C. Betting on odd and even plus black and red for 4 square bets. 12) A. Square Bets: wagering on four numbers at once. Pays 8 to 1. Alternate terms are corner bet or a quarter bet. Along with Roulette Quiz, there is a 3-part Roulette Glossary at gamerisms.